Primary roles of turfgrass include soil stabilization, water conservation, and filtration of air and water borne pollutants. 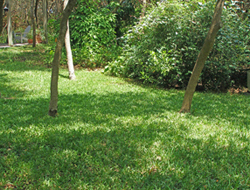 Growing turf is highly effective in controlling environmental pollution by suppressing dust, glare and noise while dissipating heat in arid and semi-arid regions. Provide a natural, comfortable, and safe setting for activities. A well maintained lawn can enhance the "curb appeal" adding as much as 15 percent to the value of a home. 2,500 square feet of lawn absorb carbon dioxide from the atmosphere, release enough oxygen for a family of four to breathe. On a hot summer day, lawns will be 30 degrees cooler than asphalt or rock and 14 degrees cooler than bare soil. Turfgrass is the most cost-effective method for controlling wind and water erosion.